We begin our adventure by the banks of the Mississippi River, where we see life through the eyes of a young boy named Huck Finn. Huck is a resourceful and spirited lad who knows how to survive on his own. He flees his father, and travels with Jim (a runaway black boy). He learns much about life from Jim. Tom Sawyer is a mischevieous adventure hungry boy who has a zest for life. He's a true romantic at heart, but not above a little trickery to get his own way, or to get out of work. Tom's life really starts to become complicated when he meets Huck. Together with Jim, they begin a series of adventures. 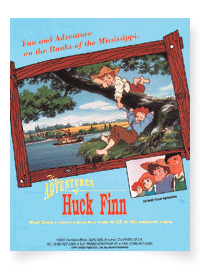 This exciting series is based on the novels "The Adventures of Tom Sawyer," and "The Adventures of Huckleberry Finn," by Mark Twain, (Samuel Clemons). They stand as timeless adventure stories filled with excitement, romance, action and laced with universal truths and lessons that appeal to all ages. A young boy who flees his father, and travels with Jim (a runaway black boy). He learns much about life from Jim. They meet Tom, while traveling down the Mississippi River. A mischevieous young boy with a resourcefulness and vivid, active imagination. A runaway black boy. He is an illiterate and superstitious boy, but is brave, generous and good. Fleeing down the river for his freedom he meets up with Huck Finn. An Evil half-breed who is a very dangerous man. Tom Sawyer's devoted, yet fussy aunt and guardian. Tom causes her to become exasperated. A beautiful blonde haired, blue eyed girl that lives next door to Tom. © 1995 ENOKI FILMS CO., LTD.